Not every mystery has an answer. Yet we crave resolution, and if we can find meaningful rationale for a confusing series of events, we’ll take it. 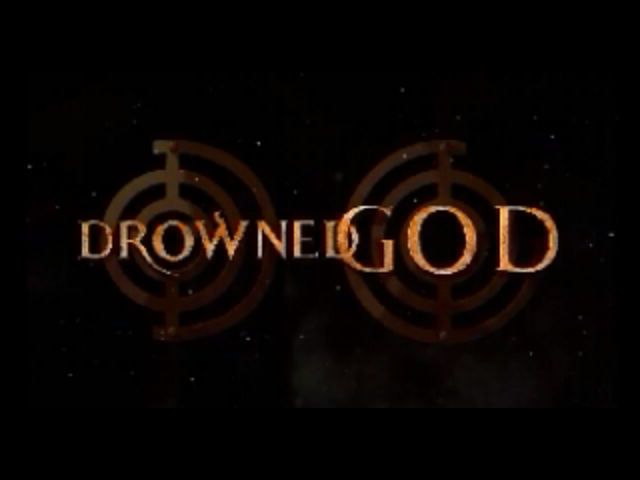 Drowned God: Conspiracy of the Ages knows this urge and uses it against you. The game fashions a grab-bag version of historical truth, raising nonsensical questions thrown together from tidbits from every religion and every corner of the world. Then it provides its own solutions, attempting to prove how its assemblage can explain all our questions about life and spirituality. This only works if you accept that the game has some sensible interpretation of its ideas in mind, and if you want assurance in Drowned God‘s barrage of recurring signs and allusions, you have no choice. It tricks you into believing in conspiracy, placing paranoia above reason, and celebrating the discovery of grand unifying knowledge that exists because it has to. What form that secret might take remains a total mystery as you enter the rooms of two dueling messengers, one fashioned after the Renaissance and the other resembling a modern boardroom. Their envoys send you on a journey to recover historical relics that may unlock more about the Drowned God. Soon you pass through the Cryptowheel – a Kaballah-invoking time machine – and visit mythological settings, each holding a relic and inevitably touched by the legacy of whoever the Drowned God is. Within each of these “realms,” you have to solve the puzzles left behind at the ancient sites as safeguards for the relics. With each solution, you inch closer to the Drowned God’s secrets; everything you interact with reveals a piece of lore (a drawing, a journal, a sculpture, or what-have-you) suggesting, perhaps, aliens at the root of this. 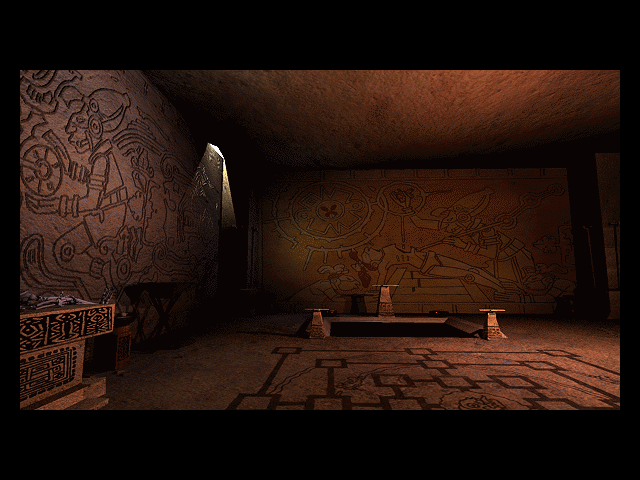 The game sneaks hints of the extraterrestrial across all manner of history and mythology, from Mesoamerican religion to the Knights of the Round Table. Most notably, it co-opts Tarot cards, both as foreboding symbols of alien activity and as a sort of supernatural currency. The worlds unveiled in Drowned God draw from a well of hallucinatory imagery and body horror. Among old stone temples and mystical ruins, machines incorporate living parts, and a screaming torso wearing antlers serves as a signal for boats. Portals open and close, never revealing how they originate. The final section, set in modern Nevada, reimagines the sunset as an apocalyptic fireball that coats the world red. The game scores this with an oppressive soundtrack, mixing traditional instruments with jarring synthesizer stings that sound purposefully hostile. Through aesthetics, Drowned God immediately establishes its voice, unearthly and indecipherable. The puzzles you solve unfortunately lack the same imagination. Usually, they adapt some physical puzzle, like Nine Men’s Morris or Lights Out, with little added context to relate them to the scene and story. They don’t add much anything to the game except a moment to sigh when you see another board game. But for the most part, they pass quickly. Drowned God wants to dwell less on the actions needed to figure out puzzles than the message they uncover. The path forward is never hidden; you can only use items in areas that require them, reducing the need to click on every surface to see what happens. 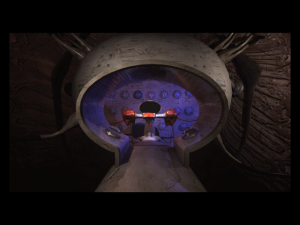 One telling puzzle, a water-powered alien organ, progresses regardless of what you press, as if the illusion of stumbling through a confusing alien device matters more than the actual act of solving it. The more thematically ambitious scenes, like an imagined conversation between Einstein and Newton about deism in physics or a bit where you erase evidence of the passage of time, are easy to complete, allowing you to reach their meaning more directly. The game directs its attention instead to its looming question, the Drowned God’s secret that ancient aliens created humans. As best as I can tell from the cryptic clues, the game suggests that all world mythology draws from the story of aliens who became stranded on Earth tens of thousands of years ago and whose Atlantean civilization was lost to the sea. The Egyptians named them: Osiris was their emperor, the Drowned God. He was betrayed and murdered by his son Horus, who catalyzed the “primitive” human race. Humans conspired to hide this knowledge for generations, encoding it in art and the works of great thinkers. Modern experiments have disturbed these secrets, calling the aliens back to the planet. Your mission is to relearn history, retrieve alien artifacts with the power over time and space, and, maybe, determine the future of the Earth. The specifics of the Drowned God’s history mean less than the implications of those secrets. In its pan-conspiratorial worldview, Drowned God sees connectedness. 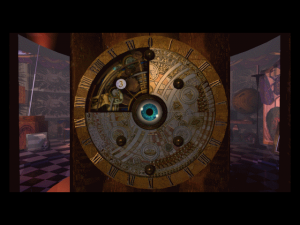 The voice in the Bequest Globe compares life to a wheel, always turning in place, like the clock on the Cryptowheel. Time moves in a cycle; people reincarnate. History repeats itself, and religious tenets converge – Kaballah, divination, the Book of Genesis, and Egyptian myth all retelling the same stories. Relics like the Holy Grail have the power to fold time in on itself, bringing ancient and modern together. Einstein and Newton can have a conversation. The wooden and metal chambers of the messengers can exist alongside each other. The island of Avalon and Area 51 live on the same spectrum, each just another distant place to blame for the world’s legends. As above, so below. Accepting Drowned God‘s argument calls for truly absurd logic. To begin even examining its ideas, you need to agree to its ridiculous terms, like the significance of numerology and a belief system where you can follow the direct lineage of Atlantis to Leonardo da Vinci. The conversation it wants to have makes no sense to an outsider. By the point when you’re attempting to understand how an alien corpse can hold the DNA for creating human-animal Manimal hybrids, you’re already too far lost in the game’s weird lexicon. Art changes to reveal extraterrestrials in our past, but what’s the point of this knowledge? Only then can you try piecing together Drowned God‘s many loose ends. The game teases its secrets with infuriating vagueness, throwing around threads and motifs that may lead somewhere without ever connecting the dots. 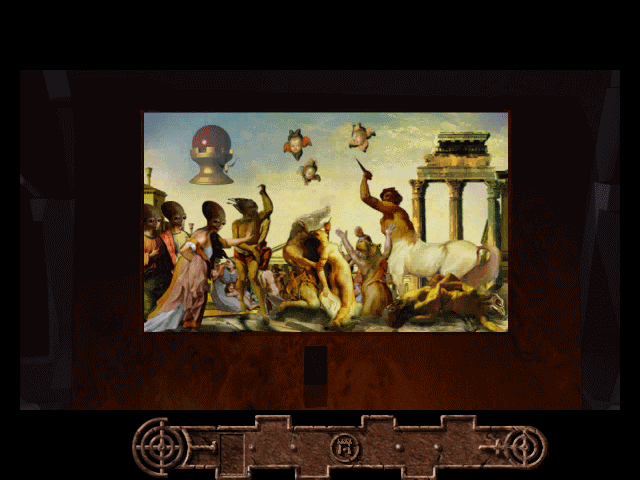 The icon of the moon turns up throughout the game, for instance, appearing in Tarot cards, visions, and illustrations of the Egyptian gods. But the game never explicitly links those references, leaving them out as stray data points from an unsolvable equation. Phrases, numbers, and symbols recur seemingly everywhere; repeated mentions of “Alpha and Omega” and the opening of Pandora foretell some great doom but never bring you closer to learning it. Direct explanations, like the offhand mention that “Stonehenge is a temporal gateway to fifth dimension,” just bewilder by introducing new concepts. You need to consult the glossary and journal in the game’s manual for more clarification. Every clue leads to another, then another after that, feeding back on itself indefinitely. You can chase these ideas to seemingly no conclusion. I keep notes sometimes when playing games to write about, and my notes for Drowned God were especially frantic and desperate for anything to ground me. 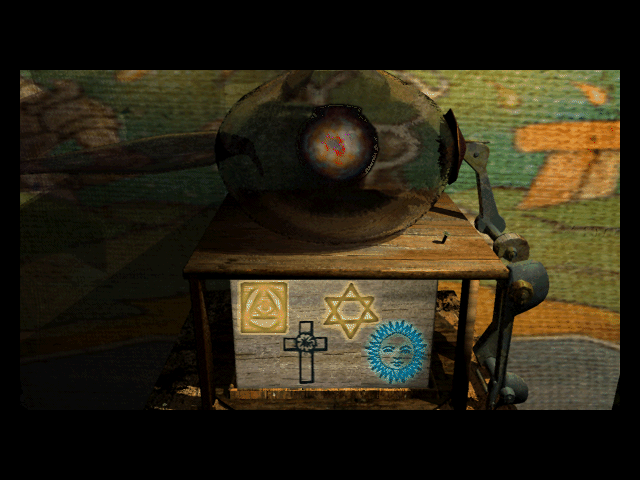 Without some revelation, the game is a bunch of abstruse hints and disjointed puzzles. Surely it has a motive. This is how a person becomes a conspiracy theorist. The search for patterns has no resolution unless brought together by some thesis, however ludicrous. To navigate Drowned God, you need to embrace conspiracy. The game pushes you to mistrust others and believe that something or someone has covered your eyes to reason. “Beware the trickery of others,” the game warns. “Who is false, and who is not?” Men in dark suits from the conspiracy staple organization Majestic 12 creep around scenes of futuristic interference, like a submarine commandeered to the Bermuda Triangle. The messengers in the Bequest Globe will try to win your trust by revealing new evidence of alien heritage, which the game frames as an attempt to butter you up rather than sincere assistance. If you take these suggestions to heart – that everyone you meet deserves suspicion and may be trying to cloud your mission – the idea of a millennia-long coverup to conceal history that conveniently ties together difficult-to-understand evidence becomes much more appealing. 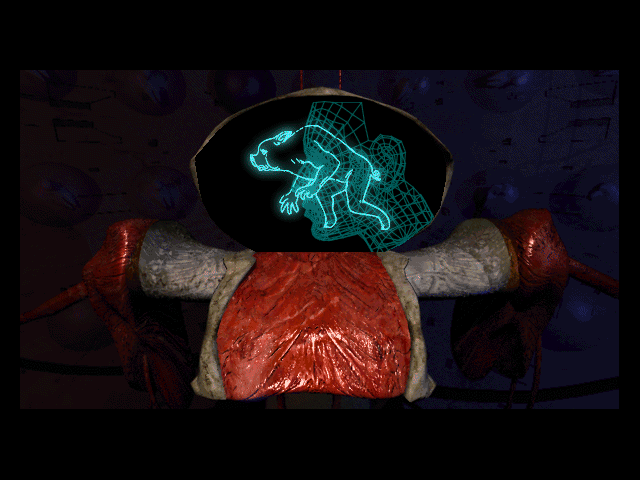 The alien organ puzzle, a facsimile of the experience of puzzle-solving, stands in for the thrill of process, even in lieu of a practical end. That’s what Drowned God loves about conspiracy. Incidental details about Osiris and Horus have less significance than the act of conspiring itself. Drawing connections from a miasma of metaphysical references and boogeymen is the entire point. The cultural singularity may be the Drowned God’s secret, but the game really discovers the seductive, machinating mindset that leads you there. According to an interview with Gamespot, Drowned God was based on a manuscript written a decade prior by the game’s director, Richard Horne. Horne intended to elaborate on the conspiracy he wrote in a sequel titled CULT which was never made: eleven years later, Horne and his wife died in an apparent suicide pact.